An ending or a beginning? Sinn Féin’s Martin McGuinness put clear blue water between himself and mainstream Irish republicanism when he shook the hand of English queen Elizabeth Windsor on Wednesday in a historic but hugely divisive act of political theatre. Always a controversial figure, the Deputy First Minister’s latest move has confused his supporters and enraged his critics. It has touched a nerve in a manner unlike Sinn Fein’s many other ‘unionist outreach’ initiatives. Greeting the British commander-in-chief while the north of Ireland remains under British rule may have been intended as a headline-grabbing peace move, but the wave of nationalist condemnation in its wake has confirmed Sinn Fein fears that it was too much, too soon. Grassroots party activists have been left struggling to justify McGuinness’s actions while bemoaning the expected loss of support and (potentially) thousands of voters. Although welcomed by many unionists (but openly mocked by some), the symbolic handshake infuriated ordinary republicans and has undoubtedly boosted support for so-called ‘dissident’ groups. It was clear from well before the actual event that Sinn Fein had not accurately gauged public sentiment. But the surprise announcement that a jubilee ‘party’ involving 25,000 flag-waving unionists was to be held at Stormont to mark Windsor’s visit threw party officials into a full-scale damage-limitation exercise. Even senior Sinn Fein figures such as Caral Ni Chuilin baulked at the plans, which had to be continually revised thereafter. The biggest change was the sudden invention of an early morning ‘culture’ event, organised by a former member of the PSNI. The difficult question of how much kowtowing McGuinness would be seen to perform was averted when it was agreed the key initial meeting was held behind closed doors. Photographs of the second, less formal handshake would be issued to capture the event. 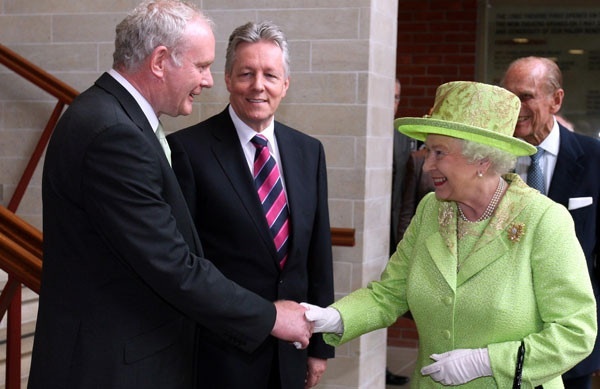 McGuinness did not bow his head, and spoke to Windsor in Irish. But his use was of an Irish language blessing - ‘Slán agus beannacht’ [Farewell and bless you] to Windsor also served to remind nationalists of the continuing refusal of the British to pass an Irish Language Act to protect the language in the north of Ireland. An address the following evening at Portcullis House, part of the houses of parliament in London, was intended to bolster McGuinness’s nationalist credentials. But few were listening, least of all the British government. In the speech, he accused the British Prime minister of “a lack of engagement” in northern Ireland politics. “This lack of engagement by David Cameron is a serious mistake and may provide a rationale for some of the damaging decisions made by Owen Paterson during his tenure at the Northern Ireland Office,” he said. He chose to soften the language of a prepared script that accused the British government of having made “a series of stupid and unhelpful decisions” on Northern Ireland in recent times. Instead, he said they had made “wrong and unhelpful decisions”. The list of British mistakes, Mr McGuinness said, included the internments of Marian Price and Martin Corey; the refusal to hold a full public inquiry into the Ballymurphy massacre of 1971, along with the decision not to honour the previous pledge to properly investigate the murder of defence lawyer Pat Finucane, added “to the sense of hurt”. But he insisted his meeting with Windsor was an important step forward. “It was a meeting which, although short in length, can I believe, have much longer effects on defining a new relationship between Britain and Ireland and between the Irish people themselves,” Mr McGuinness told the invited audience. Last night a spokesman for the Conservative Party again, diplomatically, dismissed McGuinness as irrelevant, and made clear that David Cameron had bigger fish to fry. He said “thanks to the efforts of a large number of people – including Sinn Féin – Northern Ireland enjoys political stability, and we are able to move beyond the politics of the peace process. “It is impossible to think of any political crisis in Northern Ireland today that requires the attention of the PM over and above dealing with the worst global economic crisis in 80 years and the crisis in the euro zone – something which would of course benefit every single person in Northern Ireland,” the spokesman declared. The evident lack of any reciprocal gesture from the British government for the historic peace move will make it more difficult for Sinn Fein to convince sceptical nationalists and republicans. Many victims of British violence in the North are instead lining up to denounce McGuinness. Linda Nash, whose brother William was killed on Bloody Sunday, described the former IRA commander as a “traitor” -- echoing a notorious insult he once hurled at his republican rivals. It is a word that could now come back to haunt him.